Tragedy struck the headlines recently when a nine year old boy opened the emergency door on a coach next to the toilet and fell into the road. The accident left him in a critical condition. Though unimaginably terrible for all involved, it is not the first accident of its type. Not only does this have an adverse affect on the operator of the coach, both insurance and reputation wise, but the industry as a whole. On hearing of this awful occurrence, Operations Manager at Camborne based Williams Travel, Garry Williams, decided something had to be done to prevent it from happening again. Chris Peat spoke to Garry to find out what his idea was. After much thinking and calls to his insurance broker, Garry came to the conclusion that even though operators may be following the legal regulations for signs on emergency doors, he does think additional signage is required. He believes these must have clear pictorial symbols so young children will understand the consequences of opening the emergency door whilst the coach is in motion. Taking it beyond just an idea, Garry contacted his livery provider, Redruth based Mill Signs, to design and produce some prototypes of the signs he had in mind. The result is pictured in the accompanying image to this article. It also includes some instructions for drivers to add to their safety speech to groups who carry children. He has demonstrated the sign to Traffic Commissioner Beverley Bell, who has since passed it onto the DVSA for their approval. Garry is currently looking for as many approvals of the design as possible before putting it into full production. ‘Insurance companies are not going to say no to it’, according to Garry, believing they are in favour of anything that should reduce accidents. He said the purpose of the additional signage is not money related but is intended to protect the industry’s clients. There will be a charge for the signs, but he aims to keep this minimal and suggested a contribution of profits can go to a charity, of which he is open to suggestions. Signs are not the only vehicle safety products Garry is working on at the moment, with several projects currently on the go. For instance, he is working on a warning device for coaches. A design company is carrying out a worldwide patent search for it and is starting development work on it. Although he was keeping under wraps exactly what it is, we can tell you it is intended to be both retrofitted and installed during vehicle manufacture, as well as being transferable to the wider automobile industry, including cars and vans. It is not just new products Garry has been working on to improve safety. Focusing on child safety, he has been campaigning to get an update on the Criminal Record Bureau (CRB) and Disclosure and Barring Service (DBS) disclosure legislation. He is concerned with the current interpretation of the legislation that drivers on service buses are not considered to be working in ‘regulated activity’ and therefore are not subject to the same checks required for drivers working on closed school contracts. He acknowledges that most operators do have a policy in place that all employees have a cleared CRB/DBS disclosure, which is normally authorised through the Passenger Transport Unit (PTU) at the relevant County Council. However, he is concerned a minority of operators still use drivers without a cleared DBS/CRB disclosure and says he has known some who have used drivers banned by the PTU on registered services. 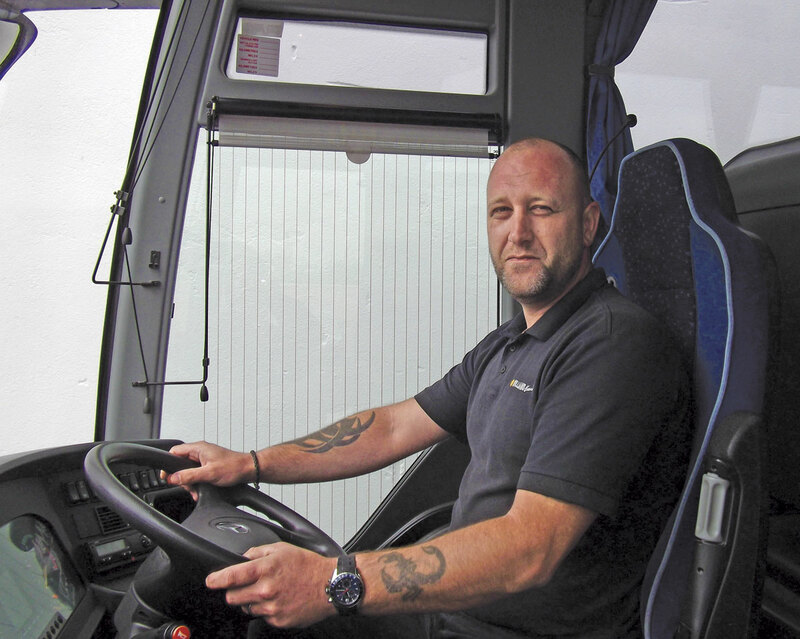 Another of his concerns is that free bus passes for registered services are issued to people with disabilities, some of whom are vulnerable and may be put in a position where they are the only passenger on a PCV with a banned or unchecked driver. He acknowledged that most schools request each year a declaration from operators that such checks have been made for their risk assessments, but he stresses there are many that do not.